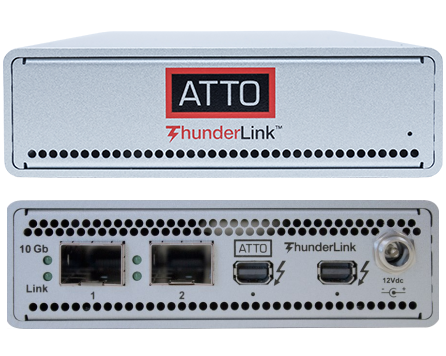 The ATTO ThunderLink NS 2102 acts as an external Thunderbolt 2 to 10GbE adapter, connecting Thunderbolt enabled all-in-one systems and laptops to 10Gb/s Ethernet networks and storage devices. ThunderLink 10GbE, with support for link aggregation and failover, offers redundancy and high availability for critical network applications. With 10Gb/s data transfer rates and multiple offloads (TCP, IPv4, UDP), Ethernet ThunderLinks are the premier connectivity choice for bandwidth-intensive applications such as data back-up and restoration, clustered computing, IP content delivery, medical imaging, and video rendering. With multi-core processors driving the need for higher bandwidth, ThunderLink 10GbE delivers superior throughput to meet that need. 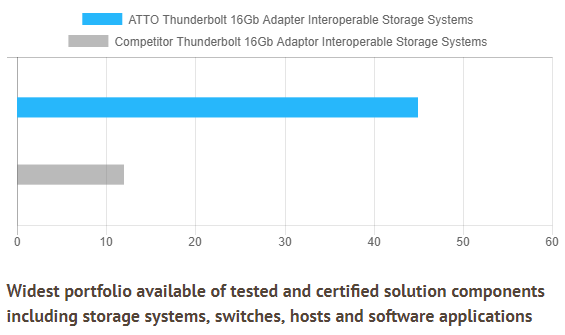 With a low profile form factor, and Thunderbolt 2 connectivity, ATTO's optical 10GbE ThunderLink adapter provides the most flexible and scalable connectivity for today's high bandwidth content creation environments. By leveraging support for software iSCSI initiators, including ATTO Xtend SAN, ThunderLink 10GbE can support both local and storage area networks. ThunderLink 10GbE offers Windows and Mac certified drivers, providing a single connectivity solution for customers with multiple operating system environments. 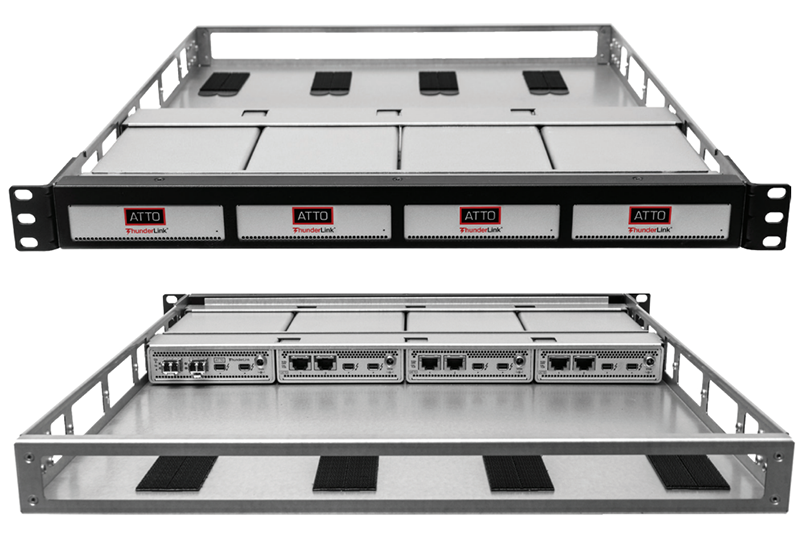 ATTO Technology has 30 years of experience developing and delivering reliable storage connectivity solutions for customers. 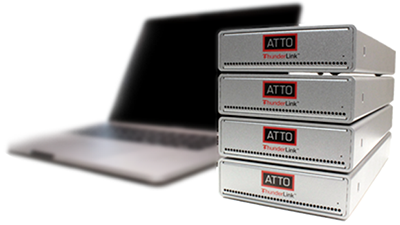 ATTO ThunderLink Ethernet adapters now provide creative professional using Thunderbolt enabled hosts, cost effective access to storage not previously available using FireWire or USB. The integrated family of ThunderLink adapters boasts an extensive list of customer design wins and certifications with respected industry partners. ATTO 10GbE adapters provide the most flexible and scalable connectivity for today's high bandwidth content creation environments. By leveraging support for software iSCSI initiators, including ATTO Xtend SAN, ThunderLink 10GbE adapters can support both local and storage networks. ThunderLink 10GbE adapters offer driver support for Windows and macOS, VMware, providing a single connectivity solution for customers with heterogeneous operating system environments. With 10Gb data transfer rates and multiple offloads (TCP, IPv4, UDP), ATTO Ethernet adapters are the premier connectivity choice for bandwidth-intensive applications such as data back-up and restoration, IP content delivery, medical imaging, and video rendering. With mult-core processors driving the need for higher bandwidth, ThunderLink 10GbE adapters deliver superior throughput to meet that need. ThunderLink 10GbE adapters provide a common foundation for both Ehternet and storage networks. The ThunderLink leverages standard OS management and monitoring tools to dramatically reduce the cost and complexity of a data center's administration and infrastructure. ThunderLink 10GbE adapter solutions allow the unparalleled performance of 10GbE to meet the performance and economic needs of today's growing data centers. 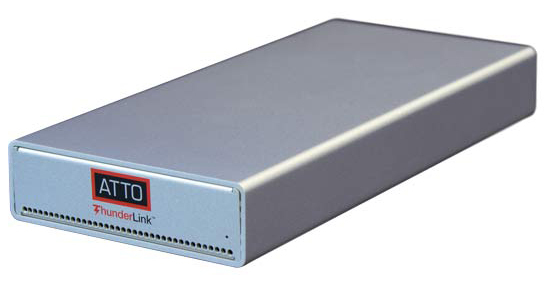 The ThunderLink is ideal for applications that require low latency, high bandwidth data transfers, such as data back-up and restoration, video-on-demand and video streaming, medical imaging, and clustered databases.